Since Chinese and British journalists first published evidence of labor rights abuses at Apple supplier factories in China in 2006, Apple has released annual reports on working and environmental conditions in its supply chain. The latest of these supplier responsibility reports was released on January 24, 2013, and it summarizes the findings from audits carried out by Apple of the practices of its suppliers in 2012. The information provided in these reports should be interpreted with great caution, especially since it relies on corporate self-assessment. Apple does not make the results of the individual factory audits available, publishing only those aggregate data and general claims that the company chooses to share with the public, and the auditors themselves are not independent of Apple. The likelihood of various labor practice violations remains far too high. For example, in more than 1 in 4 cases (28 percent), Apple itself finds that the practices of its suppliers are not in compliance with its wage and benefit standards. In nearly 4 in 10 cases (38 percent), supplier practices are not in compliance with juvenile protection standards. In more than 4 in 10 cases (41 percent), supplier practices fail to comply with ergonomic standards. There has been mixed progress in practices in the broader “labor and human rights” category, with the most notable progress a sharp reduction in the number of workers in Apple’s supply chain working more than 60 hours a week (although Apple does not indicate how many workers have workweeks that still exceed the legally relevant standard in China, which sets a maximum limit of 49 hours a week; Apple’s own code of conduct makes clear it is obligated to ensure that its suppliers obey the law). 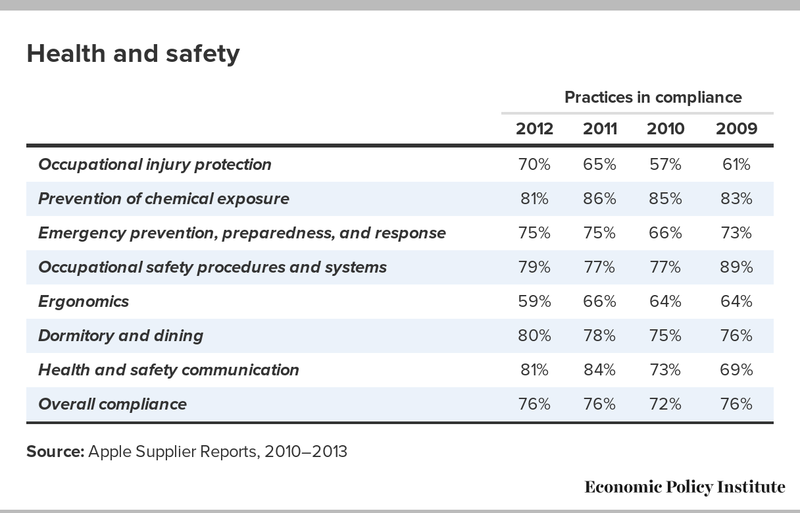 There has been no overall progress in practices related to health and safety. In other words, this latest report confirms that many workers in Apple’s supply chain continue to work in deplorable situations and that Apple has not yet spurred many of the fundamental reforms necessary to protect workers’ basic rights. In addition to the reduction in workweeks of more than 60 hours, this analysis also discusses two other signs of claimed progress flagged by Apple’s most recent report: large increases in the number of factory audits occurring and in the number of workers undergoing training related to labor rights. The reported progress in all three areas may be significantly less than appears at first blush. The information in Apple’s suppliers reports should be treated with great care, for several reasons. First, the reports are not compiled in an independent manner. The standard audits are carried out by Apple itself, and are directed by an Apple auditor. Second, transparency and detailed information are lacking. The data are presented in aggregate form, with very little information on how they are assembled and without releasing the individual audits. Third, the audits do not provide an accurate picture of certain practices. In the labor and human rights area, for instance, in all four years the factories are scored as being near-perfect when it comes to “freedom of association,” yet it is recognized by virtually all observers that no such freedom exists in Apple’s factories in China, where the only legal union is controlled by the Chinese Communist Party. Workers in China cannot organize independent unions and usually have no voice or ability to change practices in their workplace, including through collective bargaining. Fourth, the reports include rhetorical claims that are both self-serving and inaccurate. For example, Apple states in the latest report (in 20-point type), “If companies want to do business with us, they must act fairly and ethically at all times.” Foxconn, Apple’s largest supplier, has, by Apple’s own acknowledgment, engaged in a pattern of labor rights violations for at least seven years, including rampant violations of overtime and wage laws and failure to maintain safe working conditions. Foxconn has not acted “fairly and ethically at all times” and yet it has been able to “do business” with Apple, year after year, without interruption. The same is true of other Apple suppliers in whose factories serious labor rights violations have been documented over the years. While the data Apple provides in these reports have some probative value, rhetorical statements like the one noted here should be ignored. Last, since the number of Apple audits has increased significantly over time, the sampled factories have changed over time. Thus the findings from year to year are not precisely comparable. The latest report includes information on eight categories of practices related to labor and human rights and seven categories of practices related to health and safety. Although Apple typically did not discuss changes over time in these categories, roughly comparable data from its previous reports are available back to 2009. As Table 1 indicates, the most dramatic improvement in the labor and human rights area has been in the “working hours” category, where compliance (measured by whether workers work 60 hours or less per week) more than doubled from 2011 to 2012, rising to 92 percent. The data may not be precise, but this is significant progress. At the same time, however, this progress is less meaningful when considered in context. The majority of workers making Apple products are employed in China, where the maximum legal workweek is not 60 hours, but 49 hours. Apple does not provide any information on what percentage of workers are subject to workweeks in excess of this legal maximum. The issue of hours of work is discussed further below. There has been some apparent progress when it comes to “wages and benefits,” but not nearly as rapid or as significant as is needed. In more than 1 in 4 cases, or 28 percent of the time, wage and benefit practices are not in compliance with the law. This lack of compliance is not discussed in any detail in the main text of Apple’s report, but in the back, Apple indicates that violations include insufficient base wages and incorrect payment for overtime and national holidays. In the area of labor and human rights, the worst category of compliance is juvenile worker protection. As defined by Apple, these are workers who are legally old enough to work but are younger than 18. Compliance is just 62 percent, with this figure dropping significantly from previous years. Violations here include assigning juveniles to work in positions that are not suitable, such as heavy lifting. ** Starting in 2012, Apple tracked this category on a monthly basis, measuring whether work hours exceed 60 hours weekly. As choppy and insufficient as progress has been in the area of labor and human rights, it has been even less adequate in the area of health and safety. As Table 2 indicates, overall compliance in this area was reportedly the same in 2012 as it was in 2009. Nearly 1 in 4—or 24 percent—of suppliers’ practices in this area were not in compliance in both years. Apple reported improvements of more than five percentage points in only two categories—occupational injury protection and health and safety communication—and even in these areas substantial noncompliance remains. Nearly a third of practices fail to achieve compliance when it comes to occupational injury protection, and 1 in 5 fails to achieve compliance when it comes to health and safety communication. Apple’s report highlights not only the reduction in excessive work hours, but also large increases in the number of factory audits and in worker and management training. These developments are better understood—and in certain respects less impressive—upon closer examination. The most tangible achievement reported is the increased compliance with Apple’s standard of a maximum 60-hour workweek. Apple reports 92 percent compliance with this standard in 2012, compared with 38 percent compliance in 2011. Apple states that its new, transparent system of tracking excessive work hours on an ongoing basis, and publicizing these data on a monthly basis, has helped produce this achievement. Apple and Foxconn (Apple’s largest supplier) have promised to stop breaking Chinese law in this regard by July 2013; it remains to be seen if this promise will be kept. Indeed, a misleading aspect of Apple’s latest report is that it touts the 60-hour standard, while making no mention of the fact that a 60-hour week is illegal in China and providing no data as to what percentage of suppliers are in compliance with the actual legal standard. Apple’s supplier report also provides no information on an essential companion promise made to Foxconn’s workers that the pay of workers would be protected as their overtime hours are cut. In March 2012, the Fair Labor Association issued a press release describing all the changes that Apple and Foxconn agreed would be made, which stated, “More importantly, while employees will work fewer hours, Foxconn has agreed to develop a compensation package that protects workers from losing income due to reduced overtime.” Since then, the FLA has indicated that this is also a goal to be achieved by July 2013. Meanwhile, independent reports have uncovered evidence that at least in some cases take-home pay has fallen substantially due to the reduction in work hours, and that the intensity of work has increased—workers have to complete the same amount of work but in less time. Apple reports that it increased the number of audits it conducts by 72 percent from 2011 to 2012, performing 393 factory audits covering more than 1.5 million workers last year. This continues a pattern of significant increases in audits since 2006. A modest fraction of these (28 of the 393 audits) were “surprise” (i.e., unannounced) audits; such unannounced audits are more likely to capture a true picture of a factory’s labor practices. Apple also says it carried out targeted audits in critical areas such as bonded labor; it is positive that Apple is placing particular focus on such issues. As noted, however, it is difficult to assess the usefulness of the information produced by these audits. They are not conducted in an independent manner; auditors interview workers at the factory, rather than using the superior method of offsite interviews; the results of individual audits are not released (with the exception of three audits carried out by the Fair Labor Association in early 2012); and some of the information described is clearly inaccurate. It is also unclear how many factories remain unaudited. In this area, it would be helpful for Apple to provide more information on the nature of the training itself, how in-depth it is, and how much workers actually learn. It is also essential to know who conducts the training. Generally, such work should be done by non-governmental organizations, unions, or qualified government officials, not by employers themselves. Employers have an obvious conflict of interest when called upon to educate workers about rights they may in fact be violating. Also, the impact of such training is limited by other factors. Knowledge is of modest help when workers lack any true voice in their workplace and any ability to act collectively to defend their rights and interests, which is frequently the case at Apple suppliers. This short analysis is not meant to be a comprehensive assessment of Apple’s latest supplier report, so not all the positive developments are discussed. For instance, Apple’s publication of the names and addresses of its top 200 production suppliers and its reported focus on exploitative third-party labor agents represent progress, but are not explored here. Many flaws in the supplier report are also not examined here. For example, Apple’s report does not address serious labor violations in its supply chain uncovered in recent months by independent journalists and labor rights researchers, nor news reports of large worker protests and strikes at some Apple supplier facilities in China. (We summarized much of this information in this previous analysis.) The report is silent on the issue of freedom of association (i.e., the right to organize and bargain collectively), save for the obviously false claim that these rights are respected at 98 percent of Apple supplier factories. Apple’s supplier report also deserves criticism for its silence on any changes Apple is making in its own supply chain practices—prices paid for products, delivery deadlines, production planning horizons—to address the corrosive pressures that these practices often place on suppliers. Reform is not just needed at Foxconn and other Apple suppliers; reform is also urgently needed within Apple. While limited in scope, this analysis focusing on four years of roughly comparable working condition data does point to a useful general assessment. Yes, Apple is taking steps to learn more about labor rights abuses in its supply chain, and has taken some successful steps to address certain issues. Still, Apple’s own data from this and previous reports demonstrate that the rights of workers continue to be violated on a routine basis in Apple’s supply chain, and it is not clear that the modest progress reported shows Apple to be on a path to deeper reform. For labor rights to be respected in Apple’s supply chain, and for the workers who make its products to be employed in safe and healthy workplaces, far more remains to be done. — Scott Nova is executive director of the Worker Rights Consortium, a nonprofit labor rights–monitoring organization. WRC conducts independent investigations of working conditions in factories around the world. Its mission is to combat sweatshops and protect the rights of workers who make apparel and other products. — Isaac Shapiro joined EPI in 2011 to direct work examining the economic effects of government regulation. He previously worked for nearly two decades at the Center on Budget and Policy Priorities, where he founded the center’s International Budget Project; as a senior adviser at the Save Darfur Coalition; as special assistant to U.S. Secretary of Labor Robert Reich; and for a member of Congress. Shapiro is now an EPI research associate.